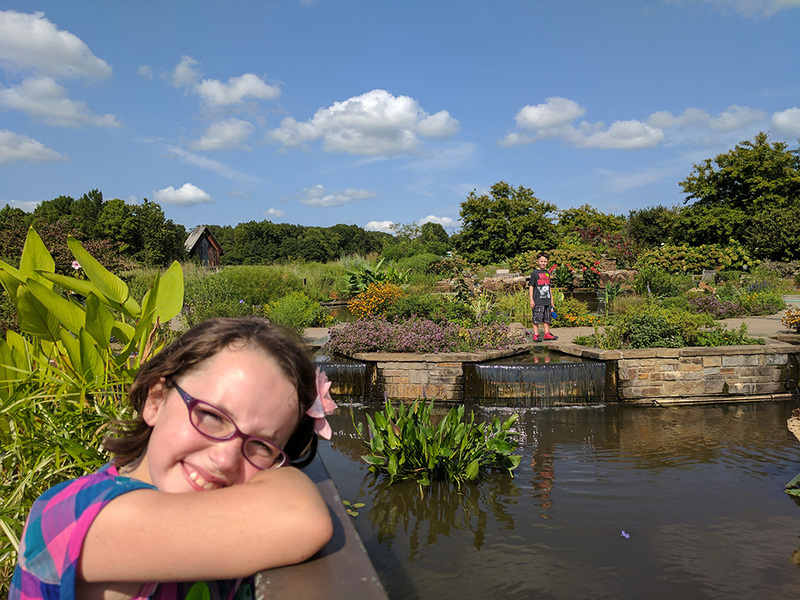 From getting married in the Marjorie Powell Allen Chapel to introducing a grandchild to gardening, families love marking milestones at Powell Gardens. Now 30 years old, Powell Gardens has a rich history and an exciting future. 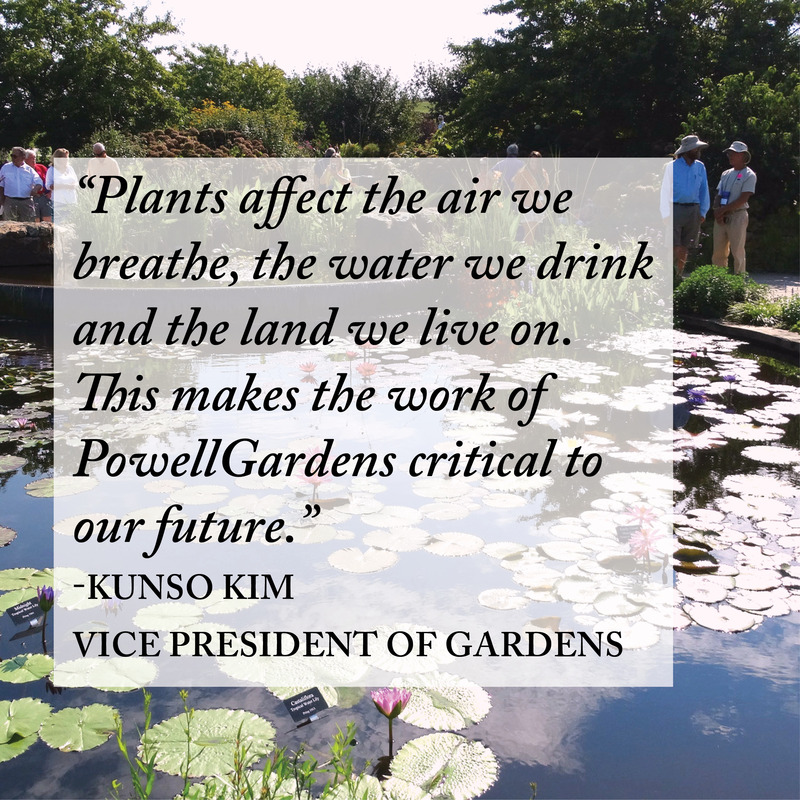 Strengthen Today to Ensure the Future, the Campaign for Powell Gardens, began in 2015 under the leadership of Executive Director Eric Tschanz. Generous friends donated $9.3 million, more than half of the $18.5 million goal. Eric retired in September 2017. A new team continues to cultivate Kansas City’s botanical garden. Our vision is to become an integral part of life in this area and earn recognition as the premiere showcase of the Midwestern landscape. 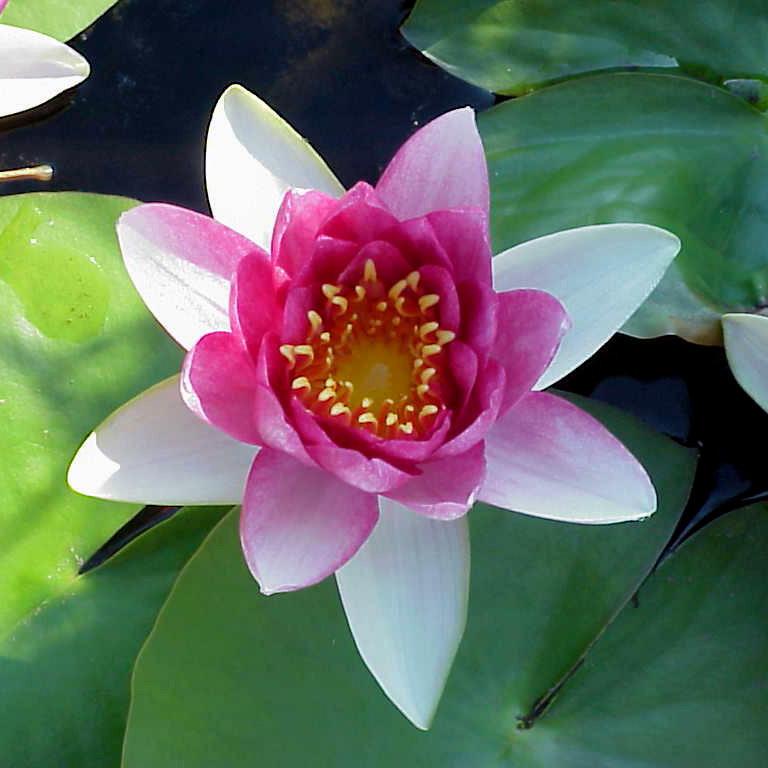 Today, Powell Gardens operates on an annual budget of $3 million, with revenues generated in equal amounts from earned income, including admissions, rentals and memberships; philanthropic gifts from individuals, foundations and corporations; and endowment income, combined with the support of the Powell Family Foundation. The Powell Gardens Board is committed to operating the Gardens in a strategic manner designed to meet the needs of visitors today while ensuring that generations to come will also be served. With the support of the Powell Family Foundation, the board recognizes that the Gardens is a community asset and is laying the groundwork to move the Gardens forward in the most responsible way to address multiple current needs and position the Gardens for long-term financial stability. The $18.5 million goal supports capital improvements ($3.5 million) and growing the organization’s endowment ($15 million). The capital components of the campaign focus on new construction to enhance current facilities and programming. The next time you visit Powell Gardens, you will see the result of a generous campaign gift—construction of the Miller Hammond Chapel Study. This building, which is adjacent to the Marjorie Powell Allen Chapel, provides a beautiful place for brides to prepare for their big day and for small meetings or retreats. The same firm that designed the Chapel and Visitor Education Center, Maurice Jennings + Walter Jennings Architects, created the plans for the study. Kansas Citian Gina Miller and her daughter Laura Hammond provided the majority of the funding for the building. Naming opportunities remain for interior spaces and the garden surrounding the Miller Hammond Chapel Study. The Marjorie Powell Allen Chapel turned 20 years old in 2016. To maintain its beauty and enhance it architectural details, work will be done to update the Chapel including staining the exterior and updating the heating and cooling. These elements will strengthen the earned rental income for the Gardens and improve the Chapel Experience for all visitors. While Powell Gardens is fortunate to have direct access from US Highway 50, the present entrance is hidden in a valley that provides limited views of the entrance and its signage. To address this issue, property was purchased on Highway 50 adjacent to the Gardens. The highly visible hilltop position is the perfect location for a new garden designed to reflect the beauty of Powell Gardens and increase awareness of the Gardens’ location and mission. The creation of a new Garden Entrance will create a focal point on the highway that will draw new visitors from the 15,000 cars passing by daily. An iconic piece of Kansas City art, the Sheaves of Wheat, will front the new entrance catching the attention of those passing by. Created in 1966 by Kansas City artist Jac Bowen for the Board of Trade Building on Main Street, the sculpture is considered the “world’s largest hand-wrought brass relief” measuring 17 feet by 70 feet. With this reflection of the “Amber Waves of Grain” as its front, the new Entrance Garden will be an iconic splash of waving masses of native and ornamental grasses set off with colorful drifts of seasonal perennial flowers that capture our spirit of place. From spring through fall there will be something in bloom. In winter the seed heads, along with the warm shades of the billowing grasses, will provide interest and show off a new snowfall beautifully. The Sheaves of Wheat and the new Entrance Garden will soon serve as a landmark leading into and out of Kansas City. $7.5 million in new gifts + $7.5 million in Powell Family Foundation matching gifts Increasing the Gardens’ endowment is essential to ensuring that the Gardens is here for the next generation of gardeners, students, families, horticulturists and anyone who might embrace the Midwest’s spirit and gain an appreciation for the importance of plants in their lives. Dedicated funding in perpetuity for the gardens, programs, personnel and facilities is critical to fulfilling our mission. The Powell Family Foundation is leading the effort to strengthen the autonomy of the Gardens by providing a dollarfor-dollar match for all gifts to the endowment, up to $7.5 million. A successful campaign will increase the Gardens endowment by $15 million, to a total of $21 million. The larger endowment will generate about $1 million annually, allowing the Powell Gardens Board of Directors to engage in the long-term planning that is critical to fulfilling the Gardens’ mission. Powell Gardens is home to seven major gardens, each with a unique feel and purpose. From North America’s longest “living” wall on the Island Garden to the nation’s largest edible landscape in the Heartland Harvest Garden, beauty abounds in every season. Funds to endow the gardens will cover the expense of plants, maintenance, equipment, personnel and repairs while guaranteeing that the Gardens will serve the needs of its visitors for generations to come. As Kansas City’s botanical garden, the Gardens’ programs promote the history and conservation of Kansas City’s oldest trees, provide science education to area students and attract locals and tourists to its popular Festival of Butterflies to learn more about monarchs and ways to protect these and other native species. Funds to endow programs will support research, annual expenses and youth education scholarships. Central to the success of the Gardens are the horticulturists and educators who bring life and learning to visitors. Endowing positions for the Director of Horticulture and the Director of Education ensures a long-term commitment to quality leadership in these areas. The Gardens is also committed to training future leaders in public gardening. Student internship endowments provide stipends to college students gaining hands-on experience at the Gardens. The Gardens has more structures by renowned American architects E. Fay Jones and Maurice Jennings than any other public facility. The architectural highlights include the Marjorie Powell Allen Chapel, the Visitor Education Center, the Meadow Pavilion, the Gatehouse, the Missouri Barn and soon, the new Chapel Studio. Each uses natural material, wide expanses of glass that bring the outside in and lines that allow each building to blend into its surroundings. Endowed funds for facilities will cover the annual maintenance and repairs needed to preserve the timeless quality of these public buildings. The naming opportunities below remain for gifts to the endowment of more than $50,000. 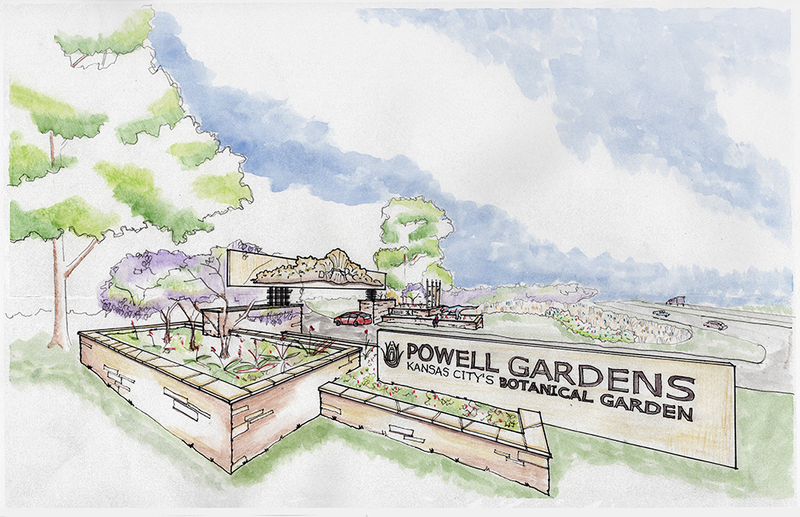 In addition to the above naming opportunities, Powell Gardens will recognize all donors who give $1,000 or more to the campaign on a donor wall in the Visitor Center.